A journey of history and tradition Experience the wonder of the festive period like locals, during perusals of Austrian and German Christmas markets, picking up handmade souvenirs and tasting your way from stall to stall. The Medieval history of these spectacular locations is evident not only through architecture, but thriving traditions. Your trip down Europe's most iconic waterway takes you on a journey through time, during evocative tours of battle sites, tutorials in traditional baking, and cities of cultural significance, with a dusting of Christmas cheer. Fly from one of up to 15 UK regional airports, where you'll be transferred to your Scenic Space-Ship, which will be docked in fascinating Bavarian Nuremberg, dating back to the 11th Century. Your cruise begins here. Settle in to your suite and get to know the ship's many amenities, before toasting to the occasion at this evening's welcome reception. From the distinguished Medieval architecture and fortifications of the Old Town, to historic WWII sites, Franconia's largest city has so much to offer. Freechoice: Visit the city's moving WWII sites on a tour, concluding with an exploration of the documentation centre. Alternatively, if you'd prefer to do something a little more light-hearted, why not join a gingerbread baking class? Freechoice: Experience the true wonder of Christmas at the romantic and picturesque markets at the Thurn and Taxis Palace. This magical village will make you feel like you have entered a fairy-tale with the gently lit lanterns and candles. Alternatively, enjoy a walking tour of Regensburg. Freechoice: Wave goodbye to the river and say hello to the Czech Republic during a visit to the World Heritage-listed old city of Ceský Krumlov. Situated on the banks of the Vltava river, the town was built around a 13th-Century castle with Gothic, Renaissance and Baroque influences. You will enjoy a guided tour of this magical destination, taking in the best of what it has to offer. Alternatively, take an excursion to magical Salzburg where a guided tour and some free time awaits. This fairy tale city, which was the birthplace of Mozart and setting for ‘The Sound of Music’, is dominated by the mighty 11th-Century Fortress Hohensalzburg. Freechoice: Be guided through Melk’s magnificent 18th-Century Benedictine Abbey. Alternatively, if you’re feeling more active, embark on an enjoyable guided bike ride along the river from Melk to one of the most enchanting villages in the region, Dürnstein – at your own pace, of course. Or visit a local winery for a guided tour and tasting of its fine wines. Freechoice: Take a guided tour of Schönbrunn Palace, and witness the sheer opulence of the Habsburg Empire. Alternatively, visit the Belvedere Museum, one of Europe’s most stunning Bsroque landmarks. You’ll have the opportunity to explore the greatest collection of Austrian art dating from the Middle Ages to present day, complemented by the work of international artists such as Claude Monet, Vincent Van Gogh, and Max Beckmann. The museum houses the world’s largest collection of Gustav Klimt’s paintings, including the famous Art Nouveau icons the Kiss and Judith. 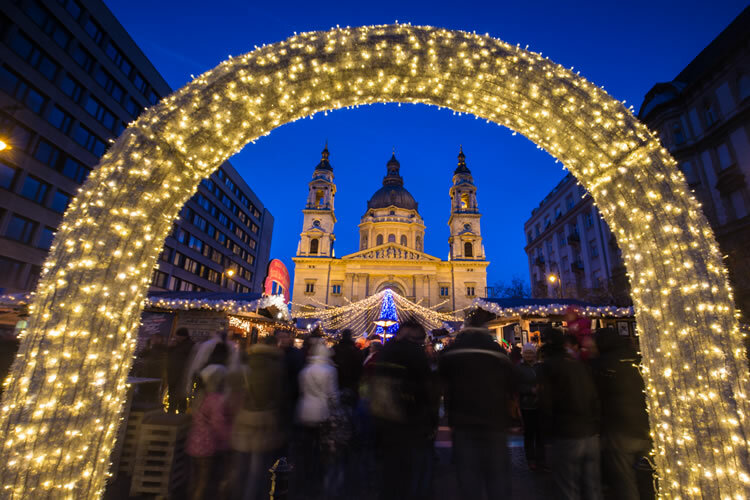 Later, explore the magical Viennese Christmas markets at your leisure. An age-old tradition, the forerunners of the present day events date back to the Middle Ages when in 1298 Albrecht I granted Vienna’s citizens the privilege of holding a December market or “Krippenmarkt”. Nowadays, over 20 official Advent Markets sell a vast array of seasonal gifts and mouth watering treats. Freechoice: Make the most of a guided tour of this city including a piano concert, or discover the Jewish heritage on a guided tour with an expert local guide. Alternatively, you can choose to journey to nearby riverside town in Pest country, Szentendre. Szentendre is known for its museums, galleries, and artist, and you’ll have the opportunity to discover this charming town on a guided city tour. Budapest is the end of your cruise, depart after a wonderful farewell breakfast. Transfer to the airport for your flight to the UK.